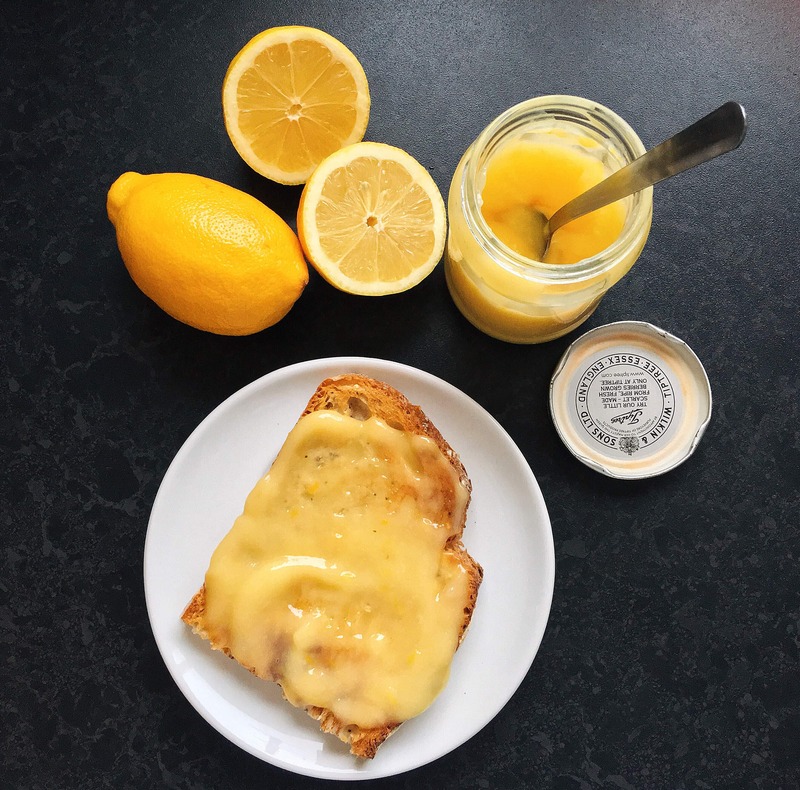 Lemon curd is probably one of the most versatile things you can make. It’s delicious spread on hot toast, freshly baked scones or pancakes, mixed with cream cheese to make a really quick but delicious tart topping (fill your tart case with the lemony filling and top with berries), spread on pavlova, or add a spoonful to buttercream icing for a zesty topping for cupcakes, the list is endless! I’m not going to claim the idea of making lemon curd in the microwave is a new thing. My friends have been raving about Rita’s recipe for years. I met the lovely Rita through the now defunct Nigella.com forum. Despite not living all that far away from each other, Rita and I have never met but we keep in touch with each other on Facebook. I saved the recipe all those years ago with good intentions, but as with many other things, I never got around to trying it. Until yesterday. I looked at the lemons sitting in the fruit bowl that were originally bought for making lemon drizzle cake (more good intentions!) I decided I would make lemon curd. I immediately thought of Rita’s recipe and decided it was about time I tried it. It was a revelation to me. I now know why my friends love it so much. I felt a bit silly because despite hearing rave reviews about the microwave method for years, there was a small part of me that was a teeny bit sceptical. I don’t completely trust microwaves. Was I going to end up with lemony scrambled eggs? I shouldn’t have worried. I had beautiful lemon curd in just 4 minutes. So if you would like to make this but have some reservations, please please just try it. From now on I will always make lemon curd this way. Thank you Rita for such a great recipe! 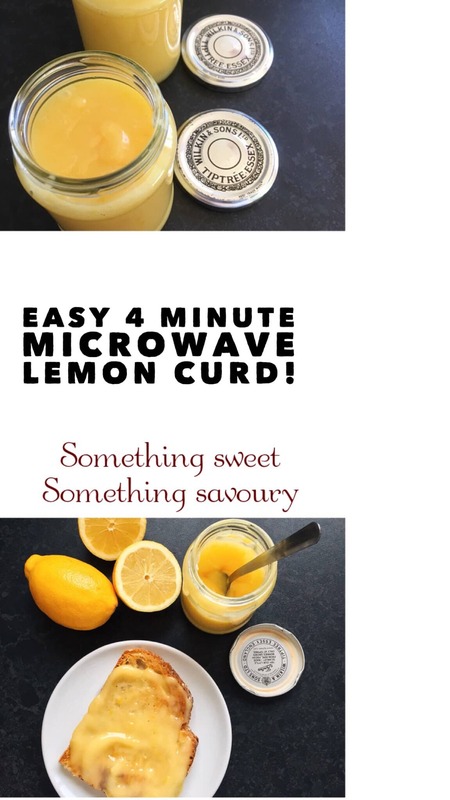 A very easy microwave lemon curd - no more standing at the stove constantly stirring! n a microwave safe bowl, whisk together the sugar and eggs. Add the lemon juice and zest. Whisk in the slightly cooled melted butter. Microwave on high, one minute at a time, whisking very well after each minute. This usually takes 3-4 minutes, but depends on your microwave. When you reach 3 minutes, I would play it safe by stopping and whisking after 30 seconds. You don’t want it to reach boiling point. My curd was ready after 4 minutes, but yours may take 30 seconds less or more. Stop when it’s visibly thickened, but do bear in mind that it will firm up quite considerably once cooled. If it coats the back of the spoon; you can draw a visible line down the back of the spoon with your finger, the curd is cooked. Strain through a sieve in case there are any tiny cooked bits of egg, then pour into sterilised jars. Keeps in the refrigerator for a couple of weeks. Makes 2 jars. What a quick way to make something delicious! By the way, I’m hosting a blog party! Its a great way to make your blog more public and meet many others. Check it out if you have time!